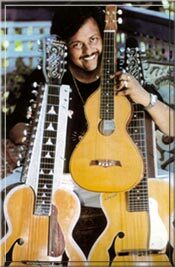 Pandit Debashish Bhattacharya Pioneer of Indian slide guitar and creator of Trinity of Guitars. Technoview of Trinity of Guitars. Here's a test to try on fellow world music: put on any track from Debashish Bhattacharya's CD Reflection of Love, and ask them to name the stringed instrument he's playing. Unless they're ethnomusicologists or experts on North Indian traditions, the chances are they'll say its sitar, or at least one of its close relatives, See them pick their jaws up off the floor when you tell them it's actually a guitar. Well, sort of guitar - a unique 22 or 24- string variant of the basic box, played lap-style, with a metal slide. Calcutta-based Debashish Bhattacharya is both a staunch traditionalist and a radical in Indian music. Whether he's playing a classical raga or a Bengali folk song, the material on Reflection of Love is ancient. But the chaturangui, as he calls his guitar, is Debashish's own creation. In 1984 after many years of playing regular western guitars, and receiving little recognition for his efforts, he had" a serious talk" with himself and came up with the idea for a bold design adaptation. "Somebody was saying inside my soul : Debashish, if you really want to see the guitar in your culture, and if you want to express your traditional sound through your guitar, you should have a new voice for it," says the maestro of the multipegged axe, interviewed in Vancouver last summer." So I talked with my instrument maker Babshindu Bishwas, and what he came up with sounded exactly as I wanted. It's not a Western sound in Indian music any -re. It's like something very traditional from India-though it's still a guitar." The chaturangui has six primary sliding strings, twelve or more sympathetic strings, and two chikaris -a pair of strings located beyond the treble main strings, and tuned an octave apart from one another. " The low chikari matches the first primary string," Debashish explains, demonstrating the different sonic elements of his immensely sophisticated instrument. "The two chikaris have their own small bridge, and it was my idea to place them here. They might be considered by Westerners to be drone strings, though they're not strictly-speaking drones as I also strike them lightly to provide rhythmic effect in the fastest tempos, almost like the fifth string on a banjo." In addition, located above the sixth string, there are two small-gauge steel wires referred to by Debashish as "supporting strings". They also act as drones. "They are usually added to melodies though sometimes the closest one is tuned two octaves above the sixth string, and played simultaneously with it. They can also be tuned to provide chords - major 7th, minor 7th, or major 6th - with the sixth string, depending on the particular raga.". Debashish has brought over the full array of instruments with which he plans to launch his Trinity Of Indian Slide Guitars revolution. Beside the chaturangui there's another large guitar - this one with 14 strings. "At first I used to change around a lot of the strings on the chaturangui, and to experiment with their arrangements," Debashish recalls. "One of my experiments was to put two of these supporting strings beside the sixth main string, tune them to it, and glide the bar on all of them. It sounded like a cry, like a singer crying." "That made me crazy for another design, and I stayed up all night in my home studio working on it. In the morning I called my instrument-maker and said to him 'make me a guitar which can handle the tension of 12 main strings, and on which I can have a couple of extra strings as drones'. He did, and the sound doesn't belong to this world. That's why I call it the gandharvi - gandharva loca is a Sanskrit term for 'cosmic world'. According to the Hindu faith this is where the gods and goddesses go with their families and associates to see and hear the highest forms of art and culture. The sustain on the gandharvi sounds as if it has unending sustain when I slide." What about the third axe? It's much smaller, and only has four strings-more of a hatchet really. Is this for close hand-to-hand encounters? In a sense it is. "It's like a ukulele played with a slide," says Debashish handing it over for inspection. "In a classical music concert some-body always would ask me-after the serious rendition of ragas, - for a short piece that's pure enjoyment. For them I have created this small lute that I call anandi. Anand is the Sanskrit word for joy."